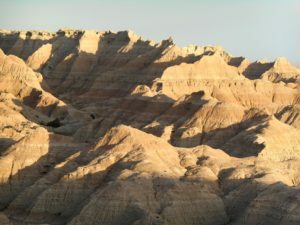 Our South Dakota trip had two destinations in the Southwestern corner of the state: The Badlands and the Black Hills. Rapid City is about halfway between the two, so we chose flights through there. In total, we spent 8 days exploring this diverse corner of South Dakota. Because of Mount Rushmore, the Black Hills — and Wall Drug–, this is a very popular vacation area. We traveled during shoulder season, arriving on Labor Day. We’ve heard that this area gets very crowded during the summer. Even at shoulder season, it was busy; we can’t imagine how crazy it must be during high season. Since we’re early risers, we usually had the road and trails to ourselves until about 10:30am. Since one of our goals was to see lots of wildlife, we definitely did the right thing! By 10am, all wildlife seemed to have disappeared. The wildlife lived up to our expectations. At Badlands National Park, we were able to get close to several small herds of bighorn sheep, and saw several groups of pronghorn antelope and of mule deer. We spent a fair amount of time marveling at the huge prairie dog cities. At one, we watched a coyote ‘harvest’ prairie dogs like he was harvesting crops. Unfortunately, we didn’t see any ferrets. The black footed ferret was extinct in the Badlands and only reintroduced in 1994. Now there are 400 – but sadly they eluded us. We were told that their only food source is prairie dogs, which were abundant. And that’s an understatement. Wildlife was even more abundant in the Black Hills We’ve read that there are 1300 bison in Custer State Park; we think we saw them all. The evening that we set aside to see the two bison herds, they were both close to the road. Actually, they were ON the road, on both sides of the road, and on every hill nearby. We saw massive males herding small females, baby bison still nursing, bison rolling in the dust, bison chewing grass, even bison “getting frisky.” To say that we were close is an understatement; we were stopped on the road and they were on every side of us, as if the car was just a part of the landscape. The experience was intense, and knowing that there were 30-60 million bison when the settlers started arriving, itmust have been an amazing sight. It appears that hunting them was hardly difficult; bison appear to be about as smart as cows. But the thought that in order to deprive Native Americans of food, that white settlers almost wiped out the bison was sobering. We also saw many pronghorn antelope. A highlight of the trip was an early morning drive where, approaching a narrow tunnel, we crossed paths with a mountain goat and her kid, licking minerals from the side of the tunnel and ignoring us totally. Another highlight was sitting on the porch in the evenings, and watching white tail deer graze on the lawn in front of us. In the Badlands, we did several short hikes to get great views of the rock formations, but also spent a lot of time driving the one road in the park at different parts of the day, watching the light on the mountains. In Custer State Park in the Black Hills, we went for many short/easy hikes, some moderate hikes, and one really strenuous death-march. We read that the parks engage in ‘difficulty inflation,’ meaning that easy hikes are listed as moderate, moderate hikes are listed as strenuous. That may be the case, except for “moderate” Custer’s Sunday Gulch Trail. We started the trail clockwise, and were treated with sweeping views of the distant hills. As we descended into the gulch (and started getting a bit tired), the trail started getting rough. Soon we were scrambling over boulders, using a handrail to help us make the ascent back to the lake (yes, ascent). The rocky climb took us 300+ feet up – about 50 feet above the lake’s shoreline. We were low on water, and had almost no energy left. But we persevered, albeit with some complaints and with legs that ached the next day. After surviving Sunday Gulch, we started choosing easier trails. The most amazing of all was Cathedral Spires Trail, which weaves through the “needles”, amazing spires of rock, and ends at a wide vista of the rock formations. The Black Hills roadside attractions seem like a throwback to 1950s. We initially assumed that the Mammoth Site was just another hokey come-on for keeping the kids from getting bored. But something prompted us to go – and it was FANTASTIC. A real estate developer was building some houses, and a backhoe hit what seemed to be bones. He immediately stopped work and got in touch with a nearby college professor – who managed the site’s excavation. The scientists ascertained that the site had been a waterhole with mud at the bottom that trapped a lot of mammoths and other animals seeking water. The developer sold the land to a non-profit at cost, under the condition that the bones would stay in situ. It’s an active dig site, and the fact that the bones were left there makes it absolutely fascinating. It feels like you are visiting a university archeological project – because you are! The interpretative signs are excellent and the sheer number of well preserved tusks and bones, many still only partially excavated, are amazing. Phil thought it was cool. Susan thought it was hokey and disliked the idea of carving faces into mountains. But we both enjoyed it and marveled at the engineering feat involved in the carving. It was fairly crowded on a shoulder-season weekday. We can’t imagine how crowded it gets in the summer. At first, this site didn’t appeal to us… but a special festival there brought us to the memorial one evening. It’s fascinating on many levels – the enormous size of the project, the story behind it, and the incredibly complex relationship that Native Americans appear to have with the dominant paradigm. However, there seemed to be a cloud of oddness at the site. Is the memorial about Crazy Horse and the Lakota and nearby tribes? Or is it about sculptor Korczak Ziolkowski and his (large) family? After viewing the museum and that evening’s presentation, we still weren’t sure. And the part of the video presentation that wove together Native American pride, service in the US Military, and American patriotism, made us feel uncomfortable. Didn’t we just see extensive museum exhibits about how the US Army expropriated Indian lands, seized their horses and property, violated treaties, evicted them from their homes, and massacred men, women, and children? The last survivors of Wounded Knee passed away in our generation, so the genocide of Native Americans is recent history. These events must still be present in the minds of today’s Native Americans, and we couldn’t imagine what they would think of the video we saw. We did learn that the two cultures are separated by a wide cultural and economic gulf. Poverty and unemployment is rampant on the Pine Ridge Reservation, which is the poorest county in the USA. Healthcare is minimal at best. Meanwhile, the nearby restaurants import young people from Slovakia to wait tables. Seeing this firsthand was sobering – and depressing. America has come a long way since the US Army had the authority to treat Native Americans so brutally. But it just doesn’t seem that we’re making enough of an effort to help restore the culture and the people that we nearly destroyed. We visited both Jewel Cave and Wind Cave. Both are enormous and in each we only did a short visit. Wind Cave is sacred to many of the Plains Indians, and the ranger there very respectfully shared the creation story that the ancestors originated in this cave. The formations were very interesting, but the thought of exploring those caves with just a candle, as the early explorers had done, made us wonder at their sanity. Clean, convenient, quiet, inexpensive, comfortable. The low room rate includes breakfast. Every day there were fewer and fewer items on the breakfast. There was a supermarket about 200 feet away which sold the items that ran out (fruit, granola, but also provided us with the essential beer and wine for our evenings. Lovely, roomy, clean, convenient, quiet, comfortable, in a beautiful setting about a mile up a dirt road, just a few minutes’ drive from Custer. Everything about this cabin (small house) was perfect, especially the bag of freshly baked chocolate chip cookies for our arrival. There was a barbecue and a lovely deck for watching local wildlife. The hosts couldn’t have been nicer. We strongly recommend staying here! With a 6:30am flight, we decided to spend the last night near the airport. There aren’t any hotels adjacent to the airport, but the Quality Inn is less than 10 miles away. It’s your basic hotel – clean, convenient, quiet, inexpensive and comfortable. The desk staff were exceptionally nice. When we arrived, smoke filled the air.